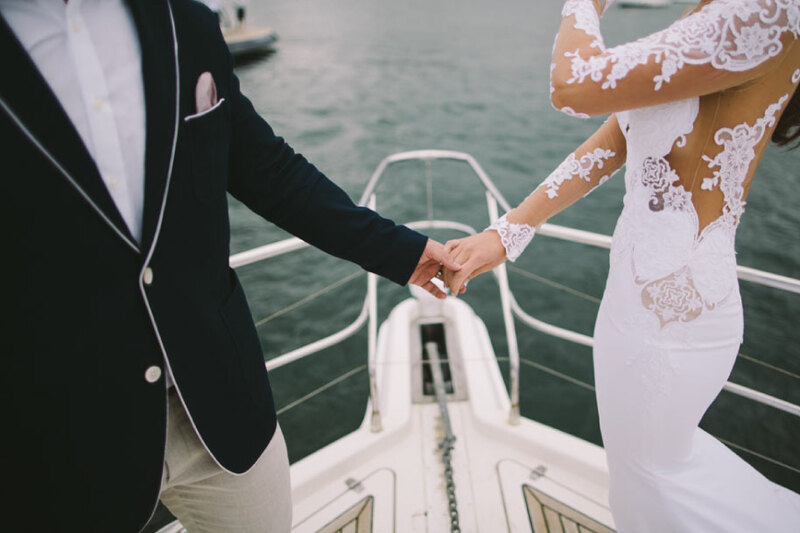 Wedding ceremonies on Sydney Harbour makes for the most romantic & ideal setting.There is nothing more spectacular and memorable than exchanging your vows on picturesque Sydney Harbour. Sydney Harbour Luxe Charters will source the most suitable vessel based on your requirements for your wedding ceremony on Sydney Harbour. Our vessels offer the ideal setting for your ceremony, wedding photos or pre-wedding drinks. Make a breathtaking entrance to your ceremony by walking down the aisle on one of our stunning luxury vessels. There are a number of locations in which the vessel can position itself for your ceremony backdrop, from the Sydney Harbour Bridge or Nielsen Park with the city in the background. Ceremonies on Sydney Harbour offer the ideal setting for your ceremony, wedding photos or pre-wedding drinks. Make a breathtaking entrance to your ceremony by walking down the aisle on one of our stunning vessels.Full of fresh ideas, Sydney Harbour Luxe Carters’ wedding coordinators specialize in designing a style for your wedding, indicative of your unique personality. We endeavor to translate your requirements and overall individual style into a working masterpiece, which will be remembered for a lifetime.